These cute little piggy banks came in a set of 4. I bought them simply because of how cute they were and wanted to add them to the gifts I had already bought for a couple of my friends. I loved them so much I am keeping 2 for myself - 1 for home and 1 to put on my desk in the office. I gave this as a return gift and all the kids loved it. Attractive design and durable. I purchased these piggy banks for my daughter's piggy themed birthday party and they were a huge hit!! They were packaged so beautifully with a lovely little saying around the box about saving. They were a good size and fantastic value. Some were broken due to shipping and Beau-Coup customer service was excellent and shipped more out to me overnight so I would receive them in time for our party. I only ever use Beau-Coup for my favors!!! For this shower we held a diaper raffle; I wanted to do multiple drawings throughout the event leading up to the Grand Prize. 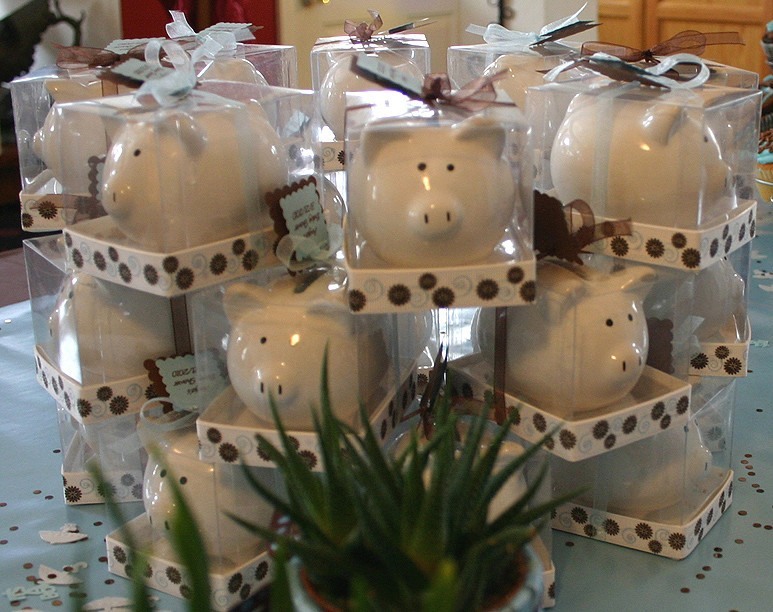 These little piggy banks made very cute and quaint little "prizes" (favors really) for the guests. We had a great time, and the value was good. I was able to provide "prizes" to almost everyone well within the allotted budget this way. These little piggies are too darn cute!!! My husband, who is a broker, gave these to our daughters 2nd grade class when he went for career day. They were a big hit with all the kids. Great quality and great price. I used this as a prize for my baby shower and it was really cute. Its even bigger than what it is shown in the picture. I really love this cute piggy bank. For the price you pay, it's really worth it. I will definitely order it again! I ordered these piggy banks as baby shower favors and everyone loved them :) [...] I wish that they had come with an option to personalize them, something as simple as a tag on the outside of the box would have been great, but I could have ordered them separately too. Overall I was very happy with this purchase and would recommend them to others. We give these little banks out to newborn babies of our customers. I bought these as favors for a baby shower. I wanted to do something beside the usual box of candy- I wanted something guests would keep and enjoy, without spending a lot. Also, they come prepackaged in a clear plastic box. Such a great party favor that is refreshingly original. A good keepsake, beats a bag full of throw-away "toys" hands down. perfect party favor for babies! our guests signed a big piggy bank for my son and we gave mini piggy banks as favors to our little guests. absolutely adorable! Used these for favors of attendant's children at the wedding rehearsal dinner for my son and his bride. used these as favors for my son's red egg & ginger banquet (traditional chinese party to welcome a new baby). i added 2 chocolate pennies to give it extra oomph. they were a real hit! really cute!!! I used this sweet little piggy as part of a larger gift basket for a new mom. [...] I didn't even unwrap it before putting in with other little treasures for the new baby. Love how tiny and special it looked! i would buy this again lovely!! i gave this as a favor for my baby shower and everybody love it!! This favor went very well with our theme "Blessed to be a Blessing" for my best friend's shower, who was having her second baby girl. I ordered for my baby shower favors. It's looks exactly same as picture shown. I loved it and everyone loved it!! i highly recommend this cute piggy bank for every occasion favors. I was very pleased with the piggy banks. I loved the way they were wrapped and everyone thought they were adorable. I highly recommend them. We are using the piggy bank for my sister's upcoming baby shower. It's something that won't get thrown away when guests brink their favor home. It comes wrapped in a nice package complete with a bow, so no added work. This came so well wrapped, protected. Used as a place marker, unwrapping and putting my own bow, attaching each person's name. Everyone loved them - especially new mom that loves pigs! I used this product as the take-home party favors for a friends baby shower. They were so cute and absolutely perfect!! They were a great value and a perfect size. [...] I definitely would recommend this product! We bought these little pigs to give out at a baby shower. We took a pen and wrote "Baby Jones" on the side of the pig. (Jones is the familys last name. Then we added a card and instructed each person to spend the year filling up the litle pig with spare change and to bring it to the Babys First Year Birtdhay Party. Everyone was excited and thrilled. Now we have to wait a year and see how many people bring the "Filled" pig to the party. Everyone loved them at the Baby Shower. Gave them out as favors at my Daughter's Baby Shower and everyone loved them. They were boxed beautifully and made wonderful favors. 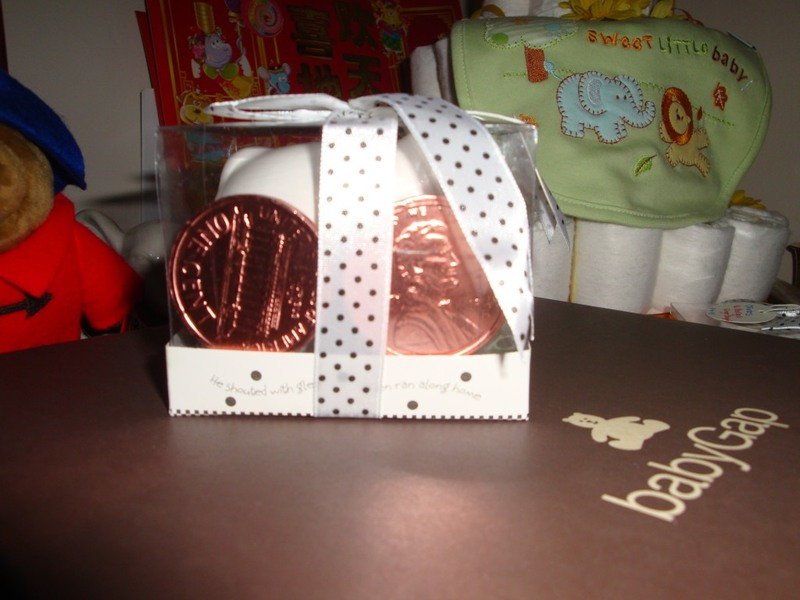 GAVE OUT THESE PIGGY BANKS FOR A BABY SHOWER FAVOR EVERYONE LOVED THEM GREAT PRODUCT THE WRAPPING WAS ALREADY DONE. I JUST HAD TO SET THEM OUT. They are cute piggy banks. I wish it came in different colors and an option to put etching or sort of labels in the pig's body instead of the ribbons. I am a uncle of 12 young nieces and nephews. Buying for all them is not easy because it take time, age different, them liking each other gift instead of their own, and making sure they like the gift that I bought! So you know we all love money! They can buy what they want and EVERYBODY IS HAPPY! This is the fifth year that I did a 2 foot money Christmas tree, each year I do the tree a different theme! I know giving money is un-personal but by me doing a money tree it makes it personal! The piggy banks here are perfect for this year Christmas tree! I will use a 2 foot green Christmas tree with white lights hanging the 12 white piggy banks. I will put a penny and a $20.00 bill in the slot of the pig. The kids can spend the $20.00 on what they want and keep the penny in the pig for good luck! These were the favors for the young gals at my sister-in-law's wedding. The girls fell in love with them! Q:Hello, could you tell me the dimensions of the box that the Baby Piggy Bank comes in? It's never too early to teach your little ones to save their change. And it helps to have a cute piggy bank for deposits! 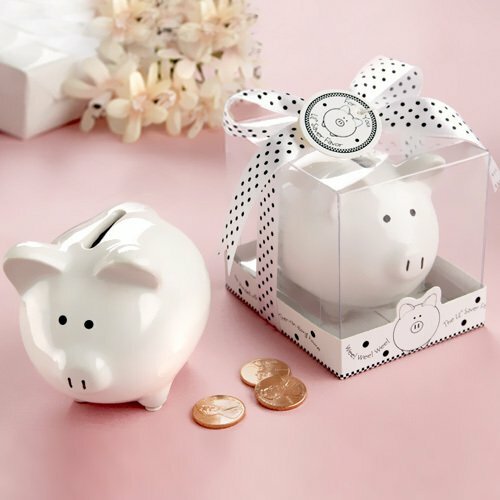 These ceramic mini piggy banks are thoughtful and practical gifts for big and little kids alike. A great favor for baby showers. Each white piggy has a coin slot on top and a hole on the bottom with a rubber stopper. Measures 3.25"L x 2.5"W x 2.5"H and comes packaged in a clear gift box and tied with a polka dot ribbon. A hang tag that says "For You, Lil' Saver Favor" hangs from each.